July 19, 2016 by Ken Ward Jr.
Word just in from the U.S. Court of Appeals for the District of Columbia about a new ruling that (again) upholds the federal Environmental Protection Agency’s veto of the Spruce Mine. Here’s a link to the ruling. This veto only impacted a relatively small section of the Spruce #1 mine, right? Less than 900 acres. Am I correct that this will have no impact on the remaining 2200+ acres? I think you might have your figures confused, Chad. Give me a call. No, Chad, that’s not correct. Has mining gone on at the site, yes. but not nearly to the extent that your comment suggests. Thanks Ken. I was confusing this with the 2007 reduction in permit acreage from 3113 to 2265. 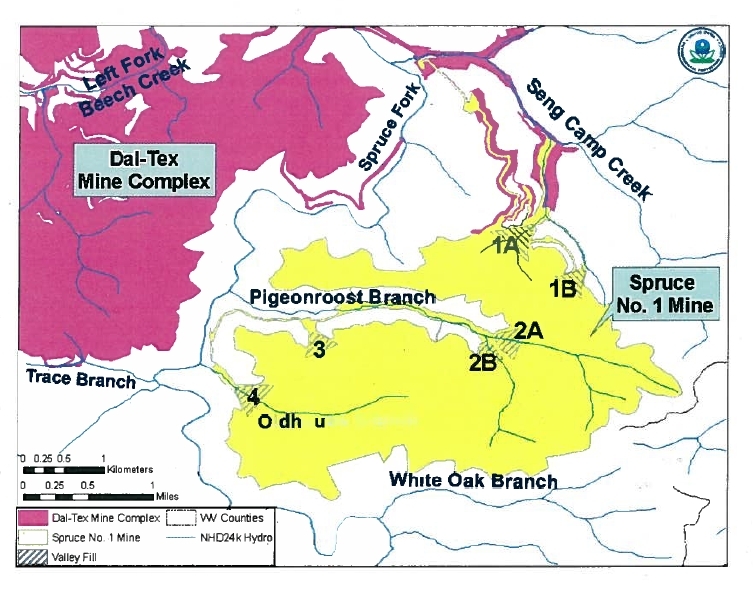 In addition to the several hundred acres that have already been mined, how much additional mining can occur on the permit now that Pigeonroost Branch and Oldhouse Branch can’t be filled? In other words, what will be the total acreage impacted by the Spruce#1 mine? The MSHA and WVDEP records for the mine currently indicate no more coal is being produced and they only have four employees doing reclamation. Obviously, the coal market has changed quite a bit since this mine was permitted in 2007. You’re looking for some kind of half-empty situation, when for citizen groups (and EPA) this ruling was a huge victory. No, not at all. This is absolutely a huge victory and I’m extremely happy about this ruling! I just ask questions about things I’m unclear on. I don’t at all mean to denigrate or downplay the importance of it, I just want to have a clearer understanding of exactly what it means. Apologies if I came off as looking for a down-side. I spent some time walking through the area last fall with folks who live nearby and wondering if all of it would be destroyed like so many other places. I couldn’t be happier that Pigeonroost Branch and the surrounding mountains aren’t going to end up looking like a mirror image of Dal-Tex across the valley. I don’t really understand why there’s always been a seeming lack of transparency about the activism around this permit. I can tell you from citizens’ inspections and satellite imagery it appears that the *bulk* of the permitted area *north* of pigeonroost branch has been “disturbed” but the rest of the permitted area is as yet untouched. I’d love for someone to tell me I’m wrong and explain why. I admire the reporting this newspaper does on surface mining, but I don’t think it’s accurate to say the EPA vetoed this permit when what they really vetoed was 2 waste disposal sites. In January 2011, the EPA rescinded the corps’ approval for Arch to dump waste rock and dirt into 6.6 miles of Pigeonroost Branch, Oldhouse Branch and their tributaries. The agency said it would allow mining to continue on another portion of the site, burying nearly a mile of streams in the Seng Camp Creek watershed, because work there already had begun. Sorry that there blog post does not have that more complete description, and that I didn’t go back and add a link to it. My apologies, Chris. That link should be fixed now. Let me know if it still doesn’t work for you.